SONOSIM SUMMARY: This study in the Journal of Emergency Medicine sought to evaluate the effectiveness of standard post-graduate medical education training for focused transthoracic echocardiography (F-TTE). Physicians were trained in F-TTE with both didactics and scanning training, followed by a 5-month period of independent scanning. 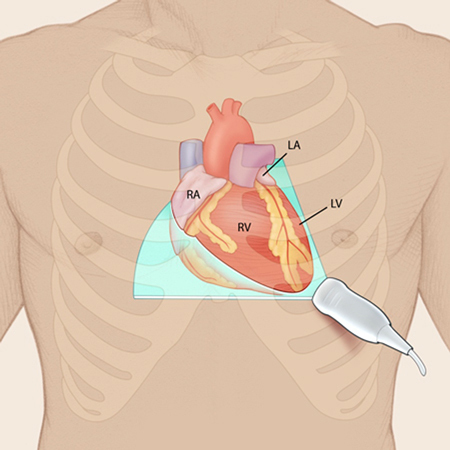 Results indicated that this training course was sufficient for physicians to develop image interpretation and image acquisition techniques in the parasternal window, however more training may be necessary to master other cardiac views. Focused transthoracic echocardiography (F-TTE) is an important tool to assess hemodynamically unstable patients in the Emergency Department. Although its scope has been defined by the American College of Emergency Physicians, more research is needed to define an optimal F-TTE training program, including assessment of proficiency. The goal of this study was to determine the effectiveness of current standards in post-residency training to reach proficiency in F-TTE. Fourteen staff Emergency Physicians were enrolled in a standardized teaching curriculum specifically designed to meet the 2008 American College of Emergency Physicians’ guidelines for general ultrasound training applied to echocardiography. This training program consisted of 6 h of didactics and 6 h of scanning training, followed by independent scanning over a 5-month period. Acquisition of echocardiographic knowledge was assessed by an online pre- and post-test. At the conclusion of the study, a hands-on skills test assessed the trainees’ ability to perform and interpret F-TTE. Ninety percent of trainees passed the written post-test. Two views, the parasternal long and short axis, were easily obtainable, regardless of the level of training or the number of ultrasounds completed. Other views were more difficult to master, but strong trends toward increased competency were evident after 10 h of mixed didactic and scanning training and > 45 ultrasounds. A short, 12-h didactic training in F-TTE provided proficiency in image interpretation and in obtaining adequate images from the parasternal window. More extensive training is needed to master the apical and subcostal windows in a timely manner.